“We have weathered so much together. 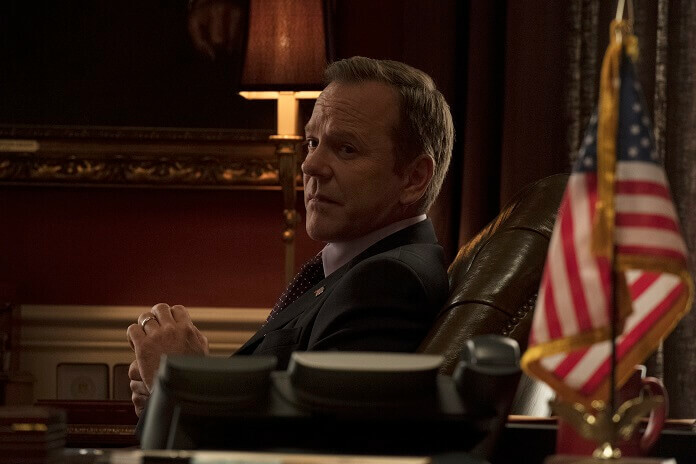 We will weather this,” says Tom Kirkman (Kiefer Sutherland) to his wife, Alex (Natascha McElhone), after learning about a new problem and possible scandal they’ll have to deal with in season two episode four of ABC’s political thriller, Designated Survivor. As the episode begins, Agent Hannah Wells (Maggie Q) has called in her discovery of the dead body of Eric Little. She also brings John Forstell (Reed Diamond) up to speed on the case, and he tells her to bring Kendra Danes (Zoe McLellan), the White House legal counsel, in on the investigation. He believes they can trust her. Meanwhile, there’s a blockade at the border of Mexico as tension mounts between the two countries. In an insane and unbelievable move, a Mexican trucker charges the blockade and in doing so gets shot and killed. Over at the White House, President Kirkman wants to find a diplomatic solution to the problem. He puts his staff on it, telling them, “We know what we need to do here, people.” The truck driver union representative Paul Zalecky meets with the President and is not happy with President Kirkman’s soft handling of the situation. He later decides to go on television trying to undercut the President’s authority. Kirkman tells Emily (Italia Ricci) and Aaron (Adan Canto) to handle it and to continue to look for a diplomatic solution. Hannah Wells meets with Kendra Dane who tells her she has to bring her findings to the First Lady and have her ask her mother if she did in fact accept a bribe to get her husband pushed up on the heart transplant list so many years ago. So, the two meet with Alex who’s both furious and insulted by the subject and by how Wells tricked her into helping provide the document that they’re investigating. Feeling foolish and bad, Wells and Kendra leave, apologizing to the First Lady. Aaron tries to meet with Senator Flores but ends up getting his own cousin who’s working for the senator. Aaron tells his cousin this isn’t going to work and he needs to talk to the senator himself. Aaron goes to see Flores and even though she’s not a big fan of the trade deal Kirkman has come up with between the U.S. and Mexico, she says she will stand by the President because it is a step in the right direction. As Aaron is leaving, he lets the senator know he didn’t appreciate her sending his own cousin to meet with him on her behalf and that he’s not easily manipulated. While all this is going on, it seems someone broke a vase that was a gift from China and there’s a young woman named Maya investigating to find out who broke it. Just when it looks as though the White House is making some headway, the widow of the truck driver goes in front of the press telling them how much her husband loved America and struggled to provide for them. Kirkman sees a way to turn this whole thing around and tells his staff to have the widow brought to the White House. The widow of the truck driver is getting ready to deliver her prepared short speech for the press when Kirkman notices her hands are shaking. He realizes what he’s doing and decides he can’t go through with it. He tells Seth (Kal Penn) he’s canceling the press event and for Seth to come up with a reason. Kirkman has the widow taken to the ladies room so she can freshen up and then to the Oval Office where he asks her about her husband in private. She tells Kirkman her husband was a good man who loved his family, baseball, and tequila. He struggled to find work to provide for them and luckily was just recently hired by the trucking company. After the widow leaves, Kirkman tells Emily to get information on the trucking company her husband worked for because he has a hunch it will have the answer to their problems. A little later, Kirkman has a short chat with his daughter, Penny (McKenna Grace), and tells her she needs to tell him the truth even if she’s afraid of getting into trouble. Penny admits to breaking his watch. Kirkman shows her a photo of the vase and asks if she broke it and she says no, just his watch, and that she’s really sorry. Kirkman hugs Penny and tells her it’s all right and has her taken back to the residence. Kendra informs Alex the FBI has issued a subpoena for Alex’s mom. Upset and having no other recourse, Alex finally brings in Tom on what’s going on. Tom is not shocked or upset by the news, but instead is strong and supportive. He says with everything they’ve been through with the attack on the Capitol, conspiracies, and him getting shot, this is not that big of a concern and that it will be okay. Kirkman meets with the owner of the trucking company who happens to be one of the advisors to the Mexican President. Kirkman tells him he knows he put the trucker up to charging the blockade and either he’s going to recommend to his superiors to sign off on the trade deal or Kirkman will make sure he’s charged with manslaughter. Needless to say, he advises for the deal. Now back to the vase… It seems Lyor Boone (Paulo Costanzo) was caught on video running back and forth and accidentally knocking it over. He apologizes to Maya who says they can discuss the matter more over dinner. The final scene has Wells going to confront Forstell about subpoenaing the First Lady’s mother. He reminds her that as the head of the FBI he has to see the investigation through no matter where that might lead them, and so does she. en vase, episode four titled “Equilibrium” continues the shift of the popular series from suspenseful political thriller to a political soap opera. Gone are the imminent threats against the nation and conspirators looking to take over. Instead, the series focuses on a crime committed over 20 years ago to save a family member that even Kirkman said is nothing compared to what they have already been through. Here’s hoping the series quickly returns to the formula that made it so intriguing and exciting in season one – politics mixed with conspiracies and deadly threats from both within the country and outside as well.